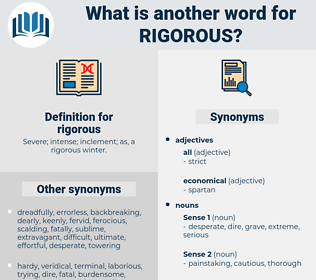 What is another word for rigorous? Severe; intense; inclement; as, a rigorous winter. precise, onerous, careful, accurate, restrictive, strenuous, painstaking, conscientious, detailed, uncompromising, stern, strictly, stiff, demanding, draconian, aggressive, grim, forceful, in-depth, diligent, burdensome, intransigent, high, challenging, methodical, exact, extensive, arduous, intense, hard, systematic, close, sophisticated, thrifty, inflexible, rough, comprehensive, compelling, resolute, fierce, authoritative, faithful, coherent, stark, cautious, economical. rigid, tough, harsh, scrupulous, meticulous, rigour, strong, robust, disciplined, tight, serious, austere, consistent, drastic, intensive, hard-hitting, stringency, thoroughgoing, exhaustive, energetic. improper, unsuitable, lax, inexact, loose, flexible, easy-going. accessible, effortless, amenable, responsive, patient, smooth, cheap, slipshod, pliable, dubious, softhearted, tolerant, careless, bland, uncomplicated, sloppy, untrue, clement, indefinite, spoiling, genial, mindless, mild, kind, manageable, merciful, sweet, willing, negligent, forbearing, indulgent, easy, inaccurate, tender, coarse, soothing, false, charitable, comforting, remiss, accepting, round, vague, simple, soft, tractable, gentle, wrong, approximate, untrustworthy, light, questionable, laid-back, clear, complaisant, compromising, user-friendly, elementary, unreliable, slovenly, affable, doubtful, unclear, doable, yielding, incorrect, friendly, neglectful, facile, achievable, pliant, painless, compliant, pampering, imprecise, kindly, agreeable, lenient, acquiescent, rough. His fancy pictured her now as sharp to every turn of language and fall of periods: and to satisfy his imagined, rigorous critic, he wrote much in the style of a newspaper leading article. Every tribe had its medicine men, who were developed by a most rigorous series of tests; such as would dismay many a white man. recherche, racehorse, regorge, recourse, ricrac, rush rose, research, recharge, rock rose, rockcress, resurge, regress, resource, race horse, ricegrass, rush-grass, rogers, rush grass, rockers, rye grass, rock hyrax, rock cress, ryegrass, rockrose, rickrack, rice grass, racecourse.